Well, that's got to be a relief to Samsung :-). Koh telling jury about the inconsistencies. "We'd like you to go back and look at those questions," Koh says. Koh to jury: I'm going to ask whatever changes you make in response to these two issues, put it in red ink. And foreperson please initial and date any changes. Lawyers are fine with that too. Verhoeven and Jacobs jump up and say "it's fine!" The problem is that it's basically impossible to make a smartphone without infringing on Apple's patents. I can't think of a single smartphone which does not infringe on any patent Apple owns. Their patents are so broad and flat out crucial to smartphones. It's like if Ford started suing everyone for making cars with a steering wheel, 4 wheels and windows. It's like if Samsung started suing everyone making TVs with small black boarders around them (being first with something doesn't mean anything as seen in this case). Court in recess at this point -- we'll hear back with a final version shortly. Koh says "I wouldn't go far." How does anyone see this as bad for consumers? It doesn't destroy innovation. It gives Apple incentive to continue developing awesome products and software without worrying about everyone profiting from their work. It forces Apple's competitors to be creative and try to innovate a bit themselves. Samsung does not care about $2.4 million it is the findings here that are important. The entire total of $1.05 billion is small change in this battle. It actually should be much higher. This encourages patent infringement. Unless products in violation are banned this is no big deal. I DO think this was way too one-sided, but I don't think the damages are unfair. There should've been some penalty for Apple's infringements (coming from an Apple fan). However, this HAD to be done and I think Samsung and the rest of the industry needs to take notes about their future product designs. Attempting to copy a product with JUST enough differences to avoid litigation may not be the best strategy..... As Cook said ".... 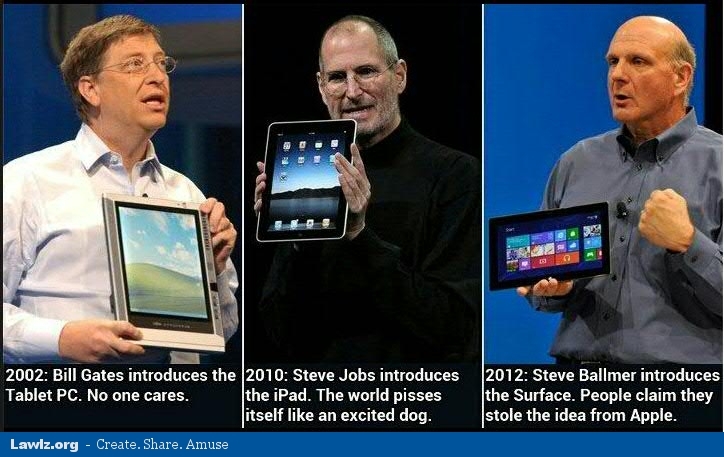 Invent your own stuff". Maybe they'll all start trying a bit harder to license patents under FRAND. I think your reporting that "Jury found Samsung violated antitrust law by monopolizing markets related to the UMTS standard" is incorrect. That was question 31, which was answered with a No. Koh says she's looking at the patent exhaustion issue, tells both sides to "meet and confer about what you want to do afterward." In the meantime, the reworded questions are being sent back to the jury while they sort out the last two items. @Matthew because the average customer would be confused and mad if he had to re-learn using his phone every time he bought a new one? @Adam Multi-touch and Pinch to zoom existed even before Apple designed iPhone. Remember Palm & Microsoft. Palm had tiling, Multitouch and pinch to Zoom. Microsoft had Surface Table and it had pinch to zoom. Then the Diamond Technologies product had most of these features! Neither Apple nor Samsung is at fault. The patent system is a broken. If Apple doesn't patent their ideas (no matter how small or insignificant they seem) someone else will and just sue them. Everyone wants to blame Apple for suing but fail to take in account all the company that sue Apple. It has just become a patent game now... get as many patents as you can to protect yourself and now that google bought Motorola they have patents to jump into the game and protect themselves as well! Design patents should have like a 5 year period where they come can make their money and then other can piggyback later. And if the company want to continue that design 5 years later they have to renew that design. @Adam um.. actually I believe that there was a slide locker on samsung mp3 players long before the ipod came out, and on sony cd players even before mp3s.. the slide to unlock was simply a touch screen recreation. Though multi touch and pinch to zoom didn't exsist on a phone, it did exsist.. apple just happened to perfect the concept before anyone else.. There are many other phones and devices that don't duplicate Apple. There are other computer stores that are not stark with geeks wearing blue shirts. There is lots of room for innovation and ideas. Companies with innovation and creativity don't have to copy. I think this is a win for anyone who has a good idea and is afraid of someone with no moral backbone coming along and claiming it as their own. P.S. Apple took GUI from Xerox, but xerox didn't spend millions of dollars developing, marketing and branding the product. They didn't even want it. How can you compare? Samsung are of course right, this is a sad day for consumers... how are they now going to buy cheap knockoffs that look to all intent like an iPhone? How ironic that the company that years ago ripped off their desktop OS now proves that it IS possible to develop a phone/tablet OS that isn't a copy of iOS. Were it not for Microsoft, all the naysayers claiming that this verdict will make smartphone development impossible might have got listened to. It's astonishing that people still think Samsung did no wrong. The jury (the people who have listened and have seen the evidence) says otherwise. Truly amazing that people treat their opinions as fact! It sure would be nice if more people understood exactly what a U.S. Patent was, and how it functioned. It gives the holder an "Exclusive" right, protected by the Laws of the United States, to produce and profit from the conceptual ideas within the scope of a Patent, for up to 16 years. Patent is different from country to country. In the United States, we Patent ideas (which become intellectual property). In Japan (for instance), they Patent the finished product only (which means that another producer can make the same product and paint it another color and its' legal). THAT is what this case is about. Apple goes to companies and licenses dozens of concepts for inclusion in their products, because others own them. Samsung had every right to do the same thing, voluntarily; dealing with products and systems that Apple patented, and did not. The judgement in this case will result in more companies paying Apple for licenses to use Apple patented ideas. Nothing more. In the mean time, Samsung will review which is more profitable, licensing or theft. The jury was absolutely right! Now it's time for Samsung to truly innovate. That's what we need in this industry. A pox on all the ripoff artists! @Unbelievable I think both companies have done wrong but the jury has not given a fair judgement esp for Samsung. Both companies should be penalised. There are many phones and devices that DON'T copy Apple to this extent, so we know it's possible. There are other options than taking your competition's product and putting your name on it with a few minor alterations. Not all computer stores are stark with geeks dressed in blue. Does Samsung really think they are fooling anyone. It's Apple-envy! Apple has not stiffled competition, they've just said, make your own stuff, do your own innovation. Have some pride. The trial is fair. Augmented reality exists today, but if someone brings it to phone, they deserve to own a patent. It is not easy to implement pinch-to-zoom. Proximity sensors, gyroscope, in a phone ... really? Apple thought about it, about the implementation. Samsung innovates and gets awarded as the top smartphone company of the world. But they do owe something to Apple. Maybe a billions dollars. 5:38 the foreperson told the CSO that they had figured out an earlier issue they had been tasked to sort out. Now it's 5:54 and they have a verdict. Clock is fast for her I guess. Koh says she's filing the originally filled out verdict form, then the amended verdict form so people can see the differences. Thanks, everyone. We're officially closed. See you at the next big verdict :-).